One of the great challenges for anyone engaged with contemporary art is how to make sense of its immediate prehistory and implications. 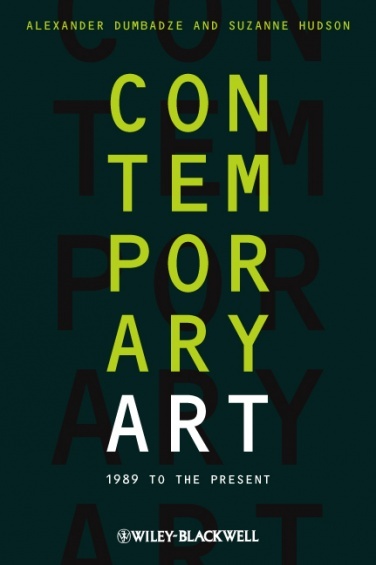 The recently published anthology Contemporary Art: 1989 to the Present (edited by Alexander Dumbadze and Suzanne Hudson, Wiley-Blackwell, 2013) brings together newly commissioned essays by fifty leading voices in contemporary art to thematically and polemically assess art and its contexts of the late twentieth and twenty-first centuries. Rather than imposing a single story, the book generates a picture of a heterogeneous whole by incorporating specific positions founded upon disparate practices, locations, and philosophies. Alexander Dumbadze is Associate Professor of Art History at George Washington University. He is the author of Bas Jan Ader: Death Is Elsewhere (University of Chicago Press, forthcoming 2013). He was recently a Visiting Professor of Art History at the Université Paris 8, and is a recipient of a Creative Capital Warhol Foundation Arts Writers Grant. Suzanne Hudson is Assistant Professor of Modern and Contemporary Art at the University of Southern California. Her writing has appeared in Parkett, Flash Art, Art Journal, and October, and she is a regular contributor to Artforum. She is the author of Robert Ryman: Used Paint (MIT Press, 2009) and is currently at work on a manuscript on art and spirituality in 1960s America. Liam Gillick is an artist based in London and New York. He has exhibited widely and represented Germany for the 53rd Venice Biennale in 2009. His numerous writings, which include Proxemics: Selected Writings 1988–2006 (2006) and a critical reader titled Meaning Liam Gillick (2009), function in parallel to his artwork. João Ribas is Curator at the MIT List Visual Arts Center in Cambridge, Massachusetts, and was previously Curator at the Drawing Center in New York. His writing has appeared in numerous publications, and he is the recipient of four consecutive AICA Awards (2008–11) and an Emily Hall Tremaine Exhibition Award (2010). Katy Siegel is a Professor of Art History at Hunter College, the City University of New York, and contributing editor to Artforum. She was the Curator of “High Times, Hard Times: New York Painting, 1967–1975,” and her books include Since ’45: America and the Making of Contemporary Art (2011) and Abstract Expressionism (2011). Irene V. Small is Assistant Professor of Art and Archaeology, Princeton University. She has contributed to journals including Artforum, Third Text, and RES: Anthropology and Aesthetics. Her forthcoming book, Hélio Oiticica: Folding the Frame, examines the emergence of a participatory art paradigm in mid-1960s Brazil.